A new Director for mima has been appointed by Teesside University to lead the international gallery forward as it becomes part of the University. Alistair Hudson will take up the key role of Director of Middlesbrough Institute of Modern Art, moving from his current position as Deputy Director at Grizedale Arts in Coniston, Cumbria. mima, this year has celebrated seven successful years with an increasing number of visitors in the last year combined with rising satisfaction levels and Alistair will build on this as the gallery is integrated with the University and together they draw on mutual strengths and experience. Over the last ten years Alistair has led Grizedale Arts from a small organisation based on a Cumbrian farm to critical acclaim from the international arts press. This success has been based on radical new thinking to reinvent the concept of artistic residencies and develop commissioned work such as last year’s Turner Prize winning Wantee with Laure Prouvost. During the last 18 years his career has tracked from the commercial sector, working at the influential Anthony d’Offay Gallery in London, to more public institutions. Before Grizedale Arts he was Curator of projects for the Government Art Collection, co-ordinating displays to promote British visual arts in the UK and worldwide and leading on the designs for the new Home Office building with artist Liam Gillick. Alistair firmly believes that art should be useful in all aspects of life and his work at Grizedale has been strongly influenced by the work of the Victorian artist and thinker John Ruskin who thought art was primarily a tool that should serve and shape society. At Grizedale Alistair says they have a new model of working with art firmly rooted in coming up with solutions to problems in the community. He is often outspoken in the arts world and already has exciting ideas for mima: 'In a time when all our assumptions about art are being challenged, I believe Middlesbrough presents a perfect situation to grow a new dynamic creative situation that could evolve mima as an exemplar institution; one that is relevant locally, nationally and internationally, leading through radical innovation and education. Moreover it should be highly valued by its constituents for how they could use art in their daily lives. This is something that Grizedale has focused on in recent years to great effect and can be developed here on a larger scale. Alistair will take up his appointment in mima in October as the gallery opens its first permanent exhibition space devoted to displaying the largest international public collection of contemporary jewellery outside of London. Councillor Charlie Rooney, Middlesbrough Council’s Executive Member for Regeneration, said: 'I’m delighted to welcome Alistair on board at this exciting time for mima as the gallery enters its new partnership with Teesside University. 'The gallery has developed a national and international reputation and it is vital for the town’s ongoing regeneration that it continues to develop and grow. Alistair Hudson joins mima as director. 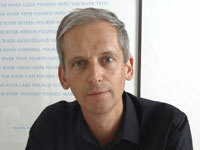 Alistair Hudson is the new director of the Middlesbrough Institute of Modern Art (mima). mima becomes part of Teesside University in September. The new director of mima plans to make the gallery "ever more relevant to the community". One of the region's major cultural venues, mima, has a new director.